CarGurus has 1,035 nationwide IS 350 listings starting at $5,500. The 2016 Lexus IS 350 enters the new model year a winner. Redesigned back in 2014 with an all-new appearance and chassis, the IS 350 took on the segment’s perennial leader, the BMW 335i, and beat it in a comparison test conducted by a respected car magazine. Then the IS 350 repeated its win in a different test. The Earth shook, BMW fans were horrified, and Lexus’ U.S. market IS sales doubled, making the car the second-best seller in the very important compact premium sports sedan segment. The 2014 redesign included a full exterior remake. Featuring the new Lexus spindle grill treatment, the next-generation IS sedan took on a sinister and more aggressive look, not to mention a “swoopier” style. Some critics were dumbfounded and compared the new look an anime cartoon car. But the subsequent jump in sales is difficult to ignore, and sales continued to increase as this look spread to other Lexus models. Lexus also reworked the sedan's interior. The simple dash was given a more modern look, with multiple levels, becoming almost busy in appearance. A remote touch interface in the center console now controls the infotainment, a system which has received mixed reviews. And available 3-D navigation, a premium Mark Levinson sound system, and more sophisticated app integration have improved the overall luxury level. Not much has changed mechanically on the IS 350 since 2014, however, although the IS line has had important overall changes which we detail in our IS 200t and IS 300 AWD previews. The V8-powered IS F ended its run in 2014, and 2015 was the last year for the IS convertible-coupe, but Lexus is continuing the winning formula that it finally found with the IS 350 sedan. Content changes for 2016 mostly affect the various available option packages. The 4-door, 5-passenger IS 350 is powered by a 3.5-liter normally-aspirated (non-turbo) V6 engine. Featuring both port and direct injection, the engine has a reputation for being smooth, quiet, and powerful. While most competitors have switched to forced induction via either supercharging or turbocharging in order to boost output, Lexus has resisted and kept the IS 350 at 306 hp for the whole of the last decade. Buyers looking for a faster 0-60 time than the IS 350’s 5.6 seconds might consider the new V8-powered RC F.
The IS 350 is available with either rear-wheel drive (RWD) or all-wheel drive (AWD). When equipped with RWD, the IS 350 comes with an 8-speed, direct shift transmission, which can either be left in automatic mode or shifted with the steering wheel-mounted paddle shifters. The transmission also matches revs on downshifts with throttle blips. AWD IS 350s use a 6-speed automatic which can also be shifted manually--there is no dedicated manual transmission available in the IS line. Multiple drive modes enable the driver to choose his or her level of aggressiveness, and the transmission is one of many systems in the vehicle that respond to the driver's settings in order to create the proper driving mood. The IS 350 is a tight-handling car that reviewers find well-balanced due to its near 50-50 weight distribution. Those not accustomed to sports sedan suspension settings may find the ride firm (or almost harsh) when the IS 350 is equipped with its optional very-low profile tires. Shoppers who want to maximize the IS 350's sportier elements can opt for the F Sport trim, which includes seats with more aggressive bolstering, a special gauge screen adapted from the Lexus LFA supercar, and a variety of sporty trim additions. A stand-alone optional F Sport exhaust will add a bit more growl. Those looking for an IS 350 should be aware that Lexus limits the availability of RWD models in snowy areas, but they can still be ordered. RWD versions of the 2016 IS 350 will start at about $41,000 where available, and adding the popular luxury and navigation packages will boost the MSRP to about $47,000. IS F Sport models in RWD will be priced at about $50,000, but do include some content from the luxury package. AWD IS 350s run about $2,000 more than their RWD equivalents. Many safety items come as stand-alone options on the IS 350 for 2016. Lexus is now offering forward collision prevention (FCP) and dynamic radar cruise control for $500, the lowest price in the luxury market. The current generation Lexus IS 350 has not been fully crash tested by the Insurance Institute for Highway Safety (IIHS), but the FCP system has been evaluated and awarded an “advanced” rating. This rating makes the 2016 IS 350 eligible to earn a Top Safety Pick Plus overall rating, pending the outcome of the IIHS small frontal overlap test. Those who are looking for a modern, highly-styled compact premium sports sedan should consider the Lexus IS 350 as a viable alternative to the other well-known vehicles in this very popular sales segment. 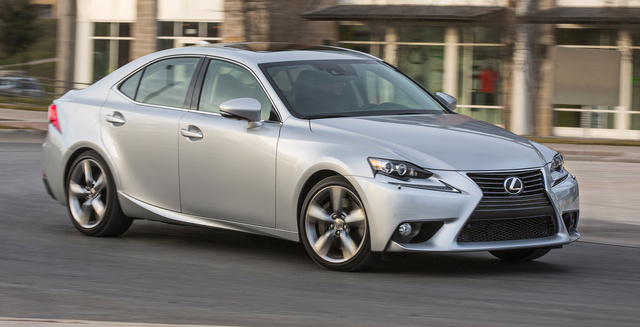 What's your take on the 2016 Lexus IS 350? Have you driven a 2016 Lexus IS 350?